Environmental Process Analysis takes a unique approach, applying mathematical and numerical process modeling within the context of both natural and engineered environmental systems. Readers master core principles of natural and engineering science such as chemical equilibria, reaction kinetics, ideal and non-ideal reactor theory, and mass accounting by performing practical real-world analyses. As they progress through the text, readers will have the opportunity to analyze a broad range of environmental processes and systems, including water and wastewater treatment, surface mining, agriculture, landfills, subsurface saturated and unsaturated porous media, aqueous and marine sediments, surface waters, and atmospheric moisture. The text begins with an examination of water, core definitions, and a review of important chemical principles. It then progressively builds upon this base with applications of Henry's law, acid/base equilibria, and reactions in ideal reactors. Finally, the text addresses reactions in non-ideal reactors and advanced applications of acid/base equilibria, complexation and solubility/dissolution equilibria, and oxidation/reduction equilibria. Environmental Process Analysis serves as a bridge between introductory environmental engineering textbooks and hands-on environmental engineering practice. By learning how to mathematically and numerically model environmental processes and systems, readers will also come to better understand the underlying connections among the various models, concepts, and systems. HENRY V. MOTT, PhD, Professor Emeritus of Civil and Environmental Engineering of the South Dakota School of Mines and Technology, is now a consultant in private practice and part-time instructor for the Civil Engineering Department of the University of Minnesota. Dr. Mott has developed and delivered a broad range of undergraduate and graduate courses, drawing upon his engineering practice experience to develop opportunities for students to apply fundamental principles in problem solving and design. His research has focused on contaminant fate and transport, physical/chemical/microbial processes, and environmental chemistry. 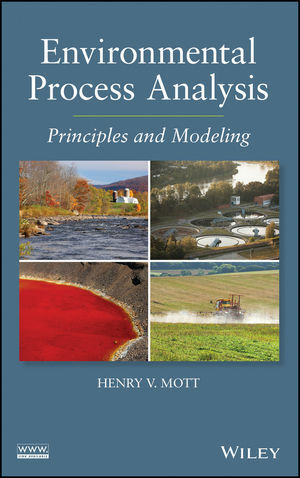 For questions regarding the content of Environmental Process Analysis, direct communications with the author can be initiated via the Author Page at www.hvmott.com.